Uniquely famous for its dairy products, blistering cold winters and the Green Bay Packers, Wisconsin hardly seems like an ideal candidate to regulate online poker and legal real money Internet poker websites. Yet, like most Midwestern states the Badger State is generally tolerant, if not downright accepting of most gambling and poker betting forms. Tribal casinos and other forms of gambling (including lawful real cash poker) thrive in Wisconsin, leading some to believe that the state most well-known for its cheese and beer will one day regulate online poker and bring Internet poker websites to the gambling fans of WI. However, to date no iGaming Internet poker legislation has been brought before WI state officials. And there doesn’t appear to be any poker website legislation in the works either. A real money US poker site account can be had in The Badger State, but you need to know where to look. Don’t worry, we’ve got you covered. 3 Can Players from Wisconsin Play Online Poker? 4 Is Online Poker Legal in Wisconsin? Wisconsin has a larger tribal presence than most states, with more than half-a-dozen unique factions inhabiting various reservations within WI’s confines. This has led to an influx of tribally run Vegas-style casinos and real money poker gambling venues in and around the Badger State. At least one of Wisconsin’s tribes, the Lac du Flambeau Band of Lake Superior Chippewa Indians, has its eye on online gambling and real cash Internet poker. In October 2013, it became the first tribe to join the Tribal Internet Gaming Alliance . A group working to facilitate the development of real-money iGaming Internet poker and casino betting platforms, the TIGA hopes to bring online gambling like real money Texas Hold’em poker to players located within tribal lands in much the same way that states like New Jersey permit online wagering at Internet poker websites within state lines. Of the nation’s hundreds of Indian tribes, over 50 have already expressed interest in the TIGA, yet to date no others have signed on. The TIGA would need at least three other tribes to join before setting up a gaming commission looking at legit real cash Internet poker laws . From there it could go about conducting online operations and running legal real money poker websites. The Lac du Flambeau has already begun exploring the iGaming Internet poker market in WI, recently launching free-play online slots, table games and Internet poker. Can Players from Wisconsin Play Online Poker? Despite its liberal gambling and poker betting stance, not all US-facing real cash poker websites accept players from Wisconsin. Determining which ones do and don’t can be a laborious process. Instead, we have created a list of poker websites by state where you can do your real money poker gambling at Internet poker online tables from WI. All of our recommended poker websites are more than welcoming to players from the Badger State, and are known for their speedy payouts, varied game selection and commitment to customer service. Let it be known that our opinions regarding the legality of online poker in Wisconsin are just that, opinions. That said, if you’re serious about registering an account on a US-facing real cash poker website and have questions, it’s best to consult a legal professional versed in Internet poker gambling law. Based on this definition, it appears that if skill plays a dominant role in a player’s decision making, than a real money poker wager would not be considered a bet in WI. However, Wisconsin courts have yet to examine poker under the dominant factor test. Thus, real cash poker cannot be clearly defined as a game of skill, at least not yet. Regulated gambling options, including the lottery, pari-mutuel betting and bingo are excluded from the definition. The penalties for running an illegal poker gambling or real cash betting operation are much more severe. Those who engage in commercial poker gambling are guilty of a felony. Based on this, even a small, weekly home game of Texas Hold’em real money poker in which the house charges a rake or entry fee is considered illegal – although it’s questionable how strictly Wisconsin’s gambling law enforcement agents crack down on these seemingly harmless smaller real cash poker games. For a deeper look at Wisconsin’s gambling and poker betting statues , please refer to the “References” section. In the early-to-mid 19th century Wisconsin’s residents held various local real money gambling lotteries to fund community organizations. Upon achieving statehood in 1848, its newly sworn-in officials began to impose restrictions upon gambling related activities in WI, but to no avail. In fact, gambling and poker betting continued to run rampant throughout the state for another 115 years, as law enforcement agencies lacked the manpower to contain it. By the 20th century, the mob had become involved with underground real cash poker gambling, prompting authorities to double their efforts. Finally, by 1965 gambling and real money betting was contained. As a compromise to those who enjoyed wagering, and would be compelled to gamble whether it was legal or not, the state began legalizing some forms of real cash gambling – including promotional betting. By the 1970s, charitable bingo and raffles were legalized, followed shortly after by pari-mutuel betting. However, due to Wisconsin’s chilly climate the state does not support any horseracing gambling tracks and thus all real money wagers must be placed at off-track sites. A statewide WI lottery was approved in 1997, and has since expanded to include seven total games, including two multi-state offerings, Powerball and Mega Millions. In 1988, federal law permitted tribal nations to construct gambling facilities and legal real money poker gambling rooms on their lands. This did not sit well with Wisconsin’s officials. Yet, by 1992 eleven betting compacts with Indian tribes were forged, and by 1998 Wisconsin’s tribes were offering blackjack, slot machines and other casino-style games like Texas Hold’em poker. Today, Wisconsin boasts over 20 active casinos, many of which offer tournament poker and legit poker cash games. The only form of gambling not permitted under Wisconsin law is commercial casinos and real cash poker rooms. The good news is that because the state boasts so many tribal casinos, the absence of the commercial variety of real money poker gambling venues is far less noticeable. 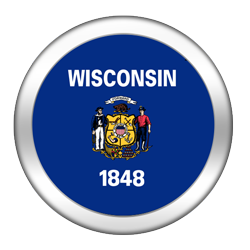 Wisconsin also allows citizens to participate in charitable gambling, place pari-mutuel bets, and to try their luck at the lottery by betting real money too. Online poker players in Wisconsin face a tough test when it comes to signing up at online poker rooms, as only a select few will accept residents from this US state. At this point, Wisconsin’s future iGaming Internet poker plans are a bit unclear. No pro-Internet real cash gambling bills have been brought before legislators in WI, nor does it look like state officials will address the issue of legal poker websites anytime soon. That said, Wisconsin’s tribes may eventually make a strong push for online wagering at Internet poker websites, if only as a means of supplementing the revenue generated from their brick and mortar casinos and real money poker rooms. And if nearby states like Michigan, which are seriously considering the merits of online poker website gambling, pass an Internet poker gambling bill, it might compel Wisconsin’s authorities to at least debate the issue of lawful real cash Internet poker. The world’s most decorated real money poker player hails from none other than Madison, Wisconsin – Phil Hellmuth. The self-proclaimed greatest poker betting player of all-time, Hellmuth has amassed an impressive array of poker hardware including 13 WSOP bracelets, the NBC Heads-Up Championship and wins at over 50 other tournaments . A true ambassador of the game of lawful real cash poker, the “Poker Brat” is perhaps the most recognizable name in all of poker, sometimes more so for his childlike antics than his superior poker gambling play. Wisconsin’s population of 5.7 million might be able to sustain a thriving poker community of real cash Internet poker players. An interstate Internet poker compact with Michigan would all but guarantee its success. But will that ever happen? Maybe. Allow tribes to conduct online poker website gambling operations, but only within their lands. Wait and see if the federal government passes an iGaming real money Internet poker betting bill. Unfortunately for WI real cash poker players, none of the aforementioned alternatives will likely see the light of day in the very near future, leaving Wisconsin natives to wait at least another year before iGaming and legal real money Internet poker is addressed. Well, either that or they could escape the cold and move to Vegas.